Dennis Meiners is available to teach workshops at colleges, studios and conferences. You can contact Dennis about scheduling. 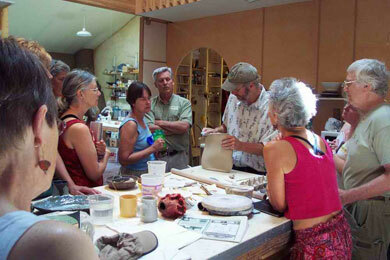 Dennis’ workshop presentations typically focus on the possibilities that arise from making slabs by hand, rather than with machines, and demonstrate the advantages of this process for discovering what we each have to say through the ceramic process. This is a simple, fun, low-tech way to use clay. Dennis demonstrates scoring, stretching, stamping, sprigging, and overlays that he uses to produce what he refers to as psychodramas on the surfaces of his utilitarian and sculptural pots hand-built from slabs. 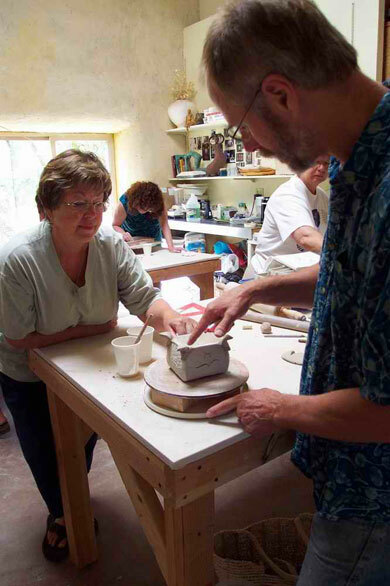 Workshop participants have the opportunity to see a way of working with clay that requires little other than a good table, homemade tools, and an ability to be observant and open to what the art-making process offers. 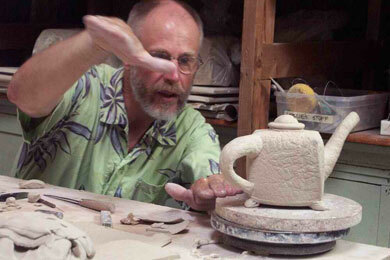 Dennis Meiners earned a BA in Fine Arts from Washington State University in 1973, and has been a full time studio potter, mostly, since then. 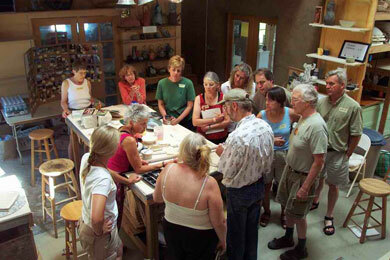 He has taught at Portland Community College, Oregon College of Art and Craft, as well as many workshops and classes. He has published articles and photographs in numerous books and magazines, and has pieces in several public and private collections, including Racine Arts Museum and the Washington Cultural Trust. For the last 15 years he has lived near Jacksonville Oregon where he built a strawbale house and adobe studio with his wife, painter and former clay artist, Leslie Lee.